Our mission is to offer our passengers a breathtaking low-flying scenic transfer that is safe, reliable, convenient, fast and affordable. With limited holiday time in Fiji, our passengers are looking to get more out of their stay. We deliver on this, with flights departing every other hour to the Mamanuca and Yasawa Islands. Frequency in flights reduces your layover time in Nadi, and you’re sure to get that convenient connection that allows for ‘same-day’ transfers. This potentially gives you an extra night or two at your island destination. 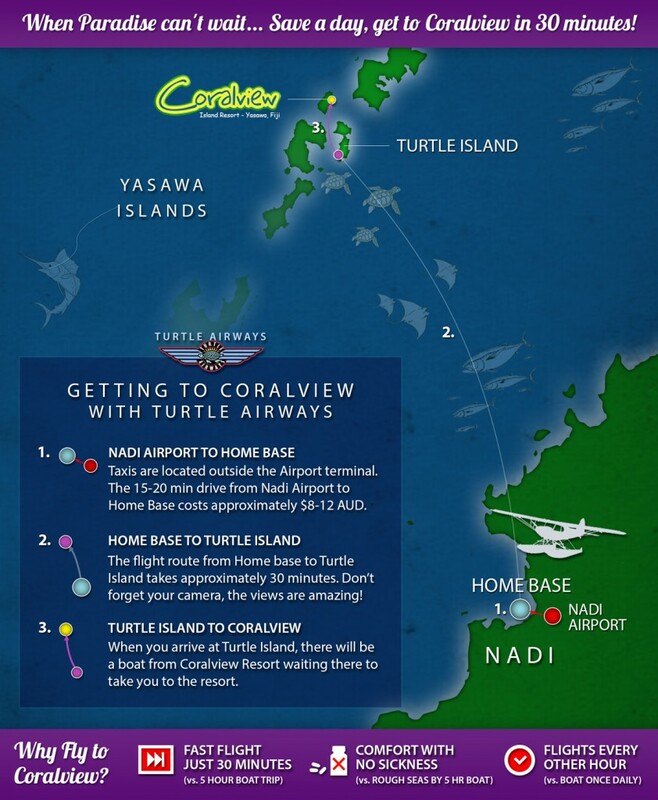 Getting to Coral View Resort is faster with Turtle Airways – a flight time of 30 minutes, versus a boat transfer of 5.5 hours. Turtle Airways is situated on Wailoaloa Beach (refer to Home Base on infographic), which is a 15-minute drive from Nadi International Airport. There are taxis located outside the terminal, and the fare runs at approximately AU$12. If you are staying at a Hotel prior to your flight with us, please enquire with the front desk about possible vehicle transfers. Taxi fares from any hotel in Nadi to our Seaplane base should be no more than AU$20. A 30-minute flight will bring you from our Home-base to Turtle Island. Upon departing our home base, we will inform Coral View Resort, and they will arrange to have a boat waiting for you at Turtle Island upon arrival. It is a short scenic boat transfer from Turtle Island to Coral View, taking only 10 minutes. Be sure to have your camera handy, as the views are amazing.